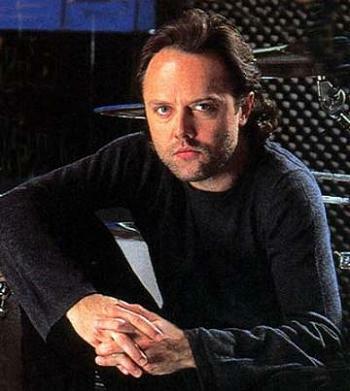 Lars Ulrich is one of the first American thrash metal drummers (from Danish origin, born in 1963), who distinguishes himself by devastating strikes, fast tempos and fairly complex phrases (notably with asymmetric measures and especially tempo changes (doubling, redoubling) in the same song and many breaks in unison). He was still inspired by European hard and metal bands (Led Zeppelin (Bonham), Deep Purple (Paice) and Iron Maiden (Mc Brain)). He is often himself the composer and arranger of Metallica songs, of which he was one of the founder and leader (with vocalist James Hetfield, from the beginning, a rare fidelity (1981, first recording)). Lars Ulrich distinguishes himself by a varied and sophisticated playing while being violent, which certainly inspired the progressive rock of Dream Theater for example (Mike Portnoy). The meeting of Metallica with a symphony orchestra fit them therefore like a glove ("S & M" with Michael Kamen, 1999 CD and DVD). Metallica is in the top four of the greatest bands of thrash metal and exceeds the hundred million albums sold. Metallica has received nine Grammy Awards (the highest American award).